You meant red, orange, yellow, blue, indigo and violet too… right? 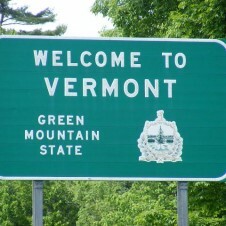 According to Passport Magazine, Vermont is the “Rainbow Mountain State,” rather than the Green Mountain State, for its multitude of offerings to the LGBT community. As the first state to pass marriage equality in 2009, the state now offers many perks for LGBT travelers year-round. “Stowe Mountain Resort’s annual Winter Rendezvous and Killington Resort’s annual Winter Gay Pride Week are great examples of Vermont’s welcoming support for LGBT equality and culture,” Ski Vermont president Parker Riehle said in a press release. “For years we’ve been proud to share in the celebration of skiing and snowboarding, Vermont’s official state winter sports, with the LGBT community.” While celebrating their pride festival on September 15, Vermont will have their festival at the Northern Decadence. Posted July 17th, 2013 & filed under Travel.